The shell pictured here is a victim of acidification. The normally-protective shell had become so thin and fragile, it is transparent. The significance of our ocean’s impact on greenhouse gas begins with the earliest ocean four billion years ago, when all the atmospheric carbon was absorbed and allowed the earth to cool enough for life to begin. In our modern era, as atmospheric carbon dioxide levels go up, the ocean absorbs more carbon dioxide to stay in balance. Currently the ocean is holding 50 times more carbon than the atmosphere and is slowing the rate of climate change by absorbing about 30 percent of carbon dioxide from cement production and other activities. But there’s an important side effect. When carbon dioxide reacts with seawater, carbonic acid is formed—the same weak acid found in soda. Carbonic acid releases positively charged hydrogen ions, which lowers the pH level of seawater. Although ocean water is still alkaline, the term “acidification” refers to a gradual shift toward the acidic end of the scale. The pH scale ranges from 0 to 14; 7 is neutral, lower numbers are acidic and higher numbers are alkaline. Over the past 300 million years, ocean pH has averaged about 8.2, but since preindustrial times it has dropped 0.1 to a current average of 8.1. This may not sound like much, but the pH scale is logarithmic, so that a pH of 7 is about ten times more acidic than a pH of 8. Thus, this drop represents a 25-percent increase in acidity over the past two centuries. There are several reactions that occur between carbon dioxide (CO2), water (H2O), carbonic acid (H2CO3), bicarbonate ion (HCO3-), and carbonate ion (CO32-). But over the long term ocean acidification leads to a decrease in the concentration of carbonate ions in seawater. Together with calcium ions they form the basic building blocks of carbonate skeletons and shells. The decline of carbonate ions impacts the ability of many marine organisms such as corals, marine plankton, and shellfish to build or even maintain their shells. There are two main forms of calcium carbonate used by marine creatures: calcite and aragonite. Calcite is used by phytoplankton, foraminifera, and coccolithophore algae. Aragonite is used by corals, shellfish, pteropods, and heteropods. When additional calcite and aragonite cannot be dissolved in water, that water is said to be supersaturated; when they can be dissolved, the water is said to be undersaturated for those minerals. Animals that need calcium carbonate are better in supersaturated water as obtaining that mineral from the surrounding water is easier. The saturation of these minerals in seawater decreases with depth, and the transition point between supersaturated and undersaturated conditions is referred to as the saturation horizon. Because aragonite dissolves more easily than calcite, aragonite is the first to be impacted by ocean acidification. For example, one might find the saturation horizon for calcite at 150 meters or even deeper, but for aragonite it would be at 100 meters. Currently, nearly all of the surface ocean waters are substantially supersaturated with regard to aragonite and calcite. However, more carbon dioxide dissolving in the ocean has caused the saturation horizon for these minerals to shift closer to the surface by 50-200 meters as compared to the 1800s. As the ocean becomes more acidic, the upper shell-friendly layer becomes thinner. 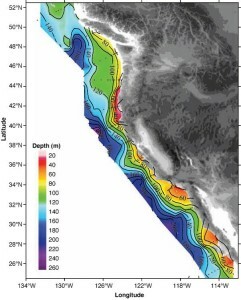 Distribution of the depths of the undersaturated water (aragonite saturation < 1.0; pH < 7.75) on the continental shelf of western North America from Queen Charlotte Sound, Canada, to San Gregorio Baja California Sur, Mexico. On transect line 5, the corrosive water reaches all the way to the surface in the inshore waters near the coast. The black dots represent station locations. The saturation horizon is much closer to the surface in regions where upwelling occurs, such as along the West Coast from British Columbia to Mexico. That’s because deep water in the North Pacific is naturally rich in CO2, since the deep water has been out of contact with the surface for 1200 to 1500 years. As water travels along the oceanic conveyer belt, it accumulates CO2 through natural respiration processes that break down sinking organic matter, generating CO2 just as humans do when they breathe. Under normal conditions (and even more so under La Niña conditions), winds blow from north to south during spring and summer months along the West Coast creating an effect known as the Ekman Transport, which in turn moves surface water away from the coastline. This warm surface water is then replaced by colder water upwelled from depths between 100 and 300 meters. This deep nutrient-rich water traditionally makes for robust fishery production. However, the naturally highly acidic water is now augmented with man-made carbon dioxide, making this carbon-rich water even more acidic. In the Northeastern Pacific, corrosive waters are already shoaling into the euphotic zone during upwelling. In 2007 Richard Feely and a team of scientists found undersaturated seawater with respect to aragonite reaching depths of about 40 to 120 meters. In one transect less than 20 miles from shore near the California-Oregon border, the saturation horizon had shoaled all the way to the surface. Without the contribution of anthropogenic CO2, the aragonite saturation horizon would be about 50 meters deeper. Because of this, the Pacific Northwest oyster-growing industry nearly collapsed before Feely and other scientists were able to help devise strategies and monitoring protocols. In 2007, the Whiskey Creek Shellfish Hatchery in Oregon lost millions of oyster larvae and later discovered that the larvae were being bathed in acidic waters drawn in by intake pipes. Oyster larvae are particularly sensitive in their first few days of life such that carbon dioxide alters shell formation rates, energy usage and, ultimately, their growth and survival. Now, the Whiskey Creek hatchery tries to balance the acidity of its waters by adding soda ash. Costs have increased and production has never fully recovered. Island Scallops, a shellfish producer in the Georgia Straight near Vancouver, lost all its scallops over a 3-year period from 2010 to 2012, during which time pH levels had dipped to 7.3. CEO Rob Saunders said that this level of pH in the water was something he hadn’t seen in his 35 years of shellfish farming. The loss amounted to 10 million dollars and a third of their workforce (20 people). No less troubling is the impact of acidification on the food chain. This year, a NOAA-led research team found evidence that acidity off the West Coast has been dissolving the shells of pteropods at double the rate since the pre-industrial era. These tiny free-swimming marine snails make up 45 percent of the diet of pink salmon and are also a food source for herring and mackerel. The highest percentage of sampled pteropods with dissolving shells were found from northern Washington to central California, where 53 percent had severely dissolved shells. Compared to Southern California, the water north of Point Conception comes from deeper depths up to the surface where the upwelling is stronger and lasts longer—from spring to fall. Because the direction of the coastline changes (from north-south to east-west) south of Point Conception, a weaker upwelling occurs in Southern California from February to May. The same NOAA-led research team found evidence of corrosive waters shoaling to depths of about 20-50 meters in the coastal waters off Washington, Oregon, and northern California; and to depths of about 60-120 meters off southern California. Anita Leinweber on board the R/V Seaworld. This has been the pattern for at least the past ten years, according to Dr. Anita Leinweber, a researcher at UCLA who has been measuring acidification levels in Santa Monica Bay for more than a decade. In a 2013 study, Leinweber and co-author Nicolas Gruber published six-year trends for pH and the aragonite saturation state in the Santa Monica Bay from 2003 to 2008. They found that the saturation horizon there reaches 130 meters on average. As the aragonite saturation state changes, this shoaling is exacerbated and the horizon could climb 20 meters by 2050 to reach an average depth of 110 meters. Median trends for pH are also decreasing by an average of about -0.004 per year between 100 and 250 meters. These trends in Santa Monica Bay are larger in magnitude than most of those reported so far — for example, about -0.003 pH units per year in Monterey Bay. They are also slightly larger than those expected on the basis of the recent trends in atmospheric CO2. The study also noted that the saturation horizon reached its highest point—the top 30 meters—during the height of the upwelling season in April and May. Lower pH and aragonite saturation states were observed during winters when La Niña conditions prevailed, which makes sense given that La Niña conditions intensify upwelling conditions. Originally published in Catalina Marine Society’s OceanBights, p. 3. Anita Leinweber, Institute of Geophysics and Planetary Physics and Department of Atmospheric and Oceanic Sciences, University of California, Los Angeles, California, interview May 17, 2014.